So, there on a weekend in the spring of 1966, Walter Bowart, Timothy Leary, and Bob Simmons crammed into my Karmann Ghia VW and buzzed up to Poughkeepsie to the headquarters of the Castalia Foundation. Bob Simmons Ed Sanders at EVO’s offices, 1966. Tim Leary was in my VW. The man. Seemed like a good dude. Walter was folded up like an accordion in the back seat. We motored upstate gabbing like magpies. We pulled into the estate of William Hitchcock Mellon where the rich folks had given refuge to Leary and his merry band. I was blown away. The main building was four stories high with turrets, gardens and verandas that went on forever. There was a tiger head over the mantel of the main fireplace. To Tim Leary it seemed normal; to me, it was otherworldly. Never mind all of that. I was up there with a job to do. Walter had borrowed a small Uher tape recorder, which was a really cool device in those early days. On top of it, I had my Nikon camera, and I was wearing a tan suit with a white shirt and a black tie. Most of all, I was sporting short hair. No wonder the sheriff didn’t ask for a letter or any credentials. Who wouldn’t trust a clean-cut white boy like me? Sheriff Quinlan was forthcoming and anxious to proselytize. We got it all on tape. Somehow I got out of his office without ever having been challenged as to whether I was actually from Look. Whew! I went back to Millbrook and played the tape for Tim and Walter. “Wow.” This was going to be funny. A couple of days later, the story was on the front page of EVO. 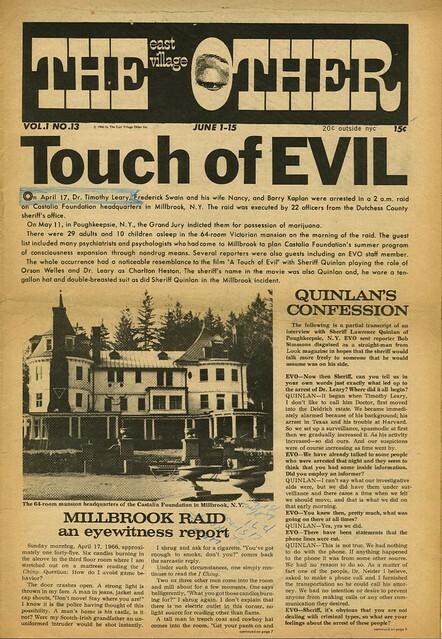 “A Touch of Evil” read the headline. Walter loved the fact that the name of the corrupt officer of the law in Orson Welles movie, “Touch of Evil,” also was Quinlan. The picture I took of the hapless publicity-hungry sheriff of Dutchess County ran alongside a picture of Orson Welles as evil Police Captain Hank Quinlan of Laredo, Texas. All we needed was Charlton Heston. Walter ran my interview with the sheriff as the lead story. He later gave the tape to Jonas Mekas, who turned it into a film called “Report from Millbrook.” It was all a joke on the Sheriff and the whole sanctimonious lot of them. 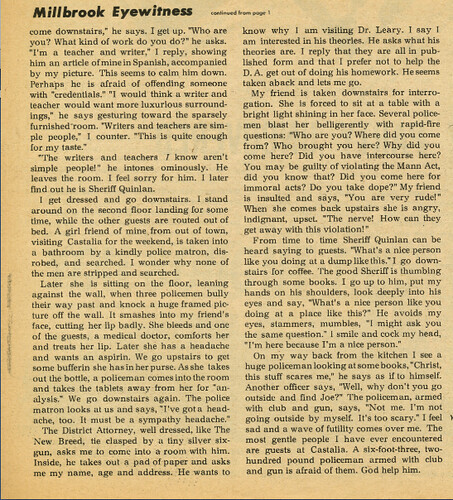 I was mainly glad that no one arrested me for impersonating a magazine reporter. In retrospect, the funniest thing about the episode was learning 20 years later that Leary’s harassment, arrest and arraignment were instigated by none other than that felonious Watergate co-conspirator, G. Gordon Liddy, who at the time was Dutchess County’s assistant district attorney. Bob Simmons is an Austin-based videographer. His piece for this series about the late Bill Beckman appeared on the Local Feb. 11.